A font is a graphical representation of text that may include a different typeface, point size, weight, color, or design. Hide or show fonts and font families you want in your programs. Hide fonts based on language settings. By default, this setting is turned on (checked) to hide installed fonts that are not designed for your input language settings. Allow fonts to be installed using a shortcut (advanced). By default, this setting is turned off (unchecked). To save space on your computer, you can choose to install a shortcut to a font file instead of the file itself. If the font file becomes unavailable, you might not be able to use the font. This tutorial will show you how to restore default font settings for your account in Windows 7, Windows 8, and Windows 10. 1. 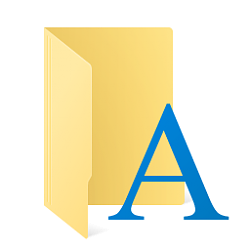 Open the C:\Windows\Fonts folder in File Explorer (Win+E). You could also open the Control Panel (icons view), and click/tap on the Fonts icon to open the Fonts folder. 4. You can now close the Fonts folder window if you like. 5. If the C:\Windows\Fonts folder is currently open, close and reopen it to apply.